On Monday, September the 10th 1649, Oliver Cromwell, encamped outside of Drogheda, with an army of 12,000 New Model Army soldiers and 11 eleven 48 pounder siege guns, summoned the Royalist commander Arthur Aston to surrender the town. Cromwell’s guns had opened two breaches in the town’s medieval walls and he planned simultaneous assaults the next day. When Cromwell warned of the ‘effusion of blood’, he was making a threat. A storm of a fortified place was a notoriously harrowing experience for the attacker and it was commonly understood that if taken by an assault, a town, its garrison and inhabitants would be punished with looting and perhaps massacre. Aston refused to surrender his garrison of around 3,000 men, composed variously of English Royalist and Irish Catholic troops. By the following evening he was dead, beaten to death with his own wooden leg by Parliamentarian soldiers. Some of the garrison and many townspeople had escaped over the town’s north wall, but most of the Royalist soldiers were dead, many of them executed after they had surrendered. The heads of the Royalist officers were bought back to Dublin where they were put on pikes lining the roads into the city Those who were spared were sent into indentured servitude in Barbados. All the Catholic priests found in Drogheda were clubbed to death, or ‘knocked on the head’ in Cromwell’s phrase. As for the civilians, it has never been established how many died in the sack of Drogheda, but it seems clear the number of non-combatant dead ran to several hundred. Cromwell limited himself to concluding that the death toll included, ‘many inhabitants’ of the town. The siege of Drogheda was perhaps the most ferocious sacking of a town in Irish history. Even today, viewed through the lense of Irish nationalist memory, it retains its capacity to inspire horror and anger. But the defenders of Drogheda were not Irish nationalists (the term nationalist did not yet even exist) and Cromwell’s army were not straightforward English imperialists. So how did English Parliamentarians come to massacre the English and Irish followers of Charles Stuart at Drogheda? What explains the savagery of the event and why is it still remembered and argued over even today? A Confederate Catholic banner, with the slogan, Vivat Carolus Rex, ‘Long Live King Charles. The war in Ireland that raged from 1641 to 1653 was confused and confusing. One Irish participant, Richard Bellings, described it as, ‘a war of many parts, carried on under the notion of so many interests, perplexed with such diversity of rents and divisions’. In one sense it was inextricably tied to the civil war in England between Royalists and Parliamentarians. In another sense it was a separate, Irish, religious war, a contest between native Catholic and settler Protestant, for control of power, land and religious hegemony. In October 1641, a small group from the Irish Catholic elite rose in revolt, in the name of the King, Charles I, to redress Catholic grievances in Ireland. Not only did their coup fail, but they unleashed the passions built up in the Kingdom of Ireland since English dominance there had been established in the reign of Elizabeth I. Catholics, displaced by Protestant settlers, turned on the newcomers, killing around 4,000 and looting and expelling tens of thousands more from their homes. The response of the King and of his representatives in Dublin was at first implacable – Scottish and English armies were both sent to Ireland in early 1642 and paid back, with at least equal ferocity, the massacres of Protestants in 1641 on the Catholic population. But within months, authority in the centre of the Three Kingdoms had collapsed. Civil war broke out in England between the King and Parliament, with the Scottish Covenanter regime allied with the English Parliament. There were a range of issues involved –absolute monarchy versus ‘English liberty’, the top-down Catholic-style Anglicanism of the King versus radical Calvinism of the Parliament, but the actual spark for outbreak of war was who – King or Parliament – would control the army sent to Ireland to put down the rebellion. Neither party trusted the other enough to allow it access to an army capable of imposing its solution to political conflicts. The war in England meant that no one power was strong enough to intervene decisively in Ireland. The Catholics managed to set up their own provisional administration at Kilkenny and to form a sort of parliament – the Confederate Catholic Association of Ireland – in order to co-ordinate their war effort and to negotiate with the King. On the Confederate banners were slogans such as ‘Vivat Carolus Rex’ – Long Live King Charles – and ‘Pro Dei Regis et Patria’ for God King and Country. Irish Catholic loyalty to the Stuart monarchy was in one sense pragmatic – the King was far less hostile to Catholicism than were his puritan enemies – but also heartfelt. For the ‘Old English’ – that is those Catholics of English or Norman descent, loyalty to the monarch had always been a central part of their identity. For those of Gaelic origin, it was widely believed the Stuarts were themselves Gaels on account of their Scottish origins. One Gaelic aristocrat had been moved to write of James I, ‘being the first of our nation that reigned over these three kingdoms, … nobody can deny him to be just King’. The Catholic Confederates held most of the centre of Ireland but around the coast were series of Protestant-held enclaves, at Dublin, Cork, north-east Ulster at Carrickfergus and west Ulster around Derry. These were themselves divided among themselves between English and Scottish, Royalist and Parliamentarian. Very broadly speaking, the English Royalists in Ireland represented those Protestants less hostile to Catholicism and willing to deal with the Confederates on behalf of the King, whereas the Irish Parliamentarians such as Charles Coote represented the hard-line settler-Protestant interest. Cork, under the command of Protestant Irishman Lord Inchiquin, changed sides from King to Parliament in 1644 and the Royalist Earl of Ormonde handed over Dublin to a Parliamentarian invasion force in 1647 rather than see it fall into Catholic hands. ‘Rather English rebels than Irish ones’ he is said to have commented. The Confederate Catholics tried, in the summer of 1647, to wipe out the Parliamentarian toeholds at Cork and Dublin but suffered two crippling defeats at the battles of Dungan’s Hill and Knocknanauss. Meanwhile, the civil war in England had ended in victory for the Parliament, which was committed to re-conquering Ireland and – through the Adventurers Act of 1642 – a massive confiscation of Catholic owned land. The King was put on trial for treason and in early 1649 executed. The Royalists and Irish Confederate Catholics, who had negotiated inconclusively throughout the 1640s, were finally thrown together out of necessity by defeat. In 1648, they negotiated a deal recognising Charles II (son of the executed Charles I) as King of Ireland with a view to restoring him in London. All Catholic forces in Ireland were put under Royalist command – headed by the Earl of Ormonde. Guarantees were made for the postwar toleration of Catholicism and autonomy of the Irish parliament. So by the time Cromwell landed in Dublin in August 1649, the highly fragmented war in Ireland, which had involved three or four antagonistic parties (who themselves all quarrelled and fought internally) had simplified into Royalist, which included English monarchists, Irish Catholics and Scottish Presbyterians, against English Parliamentarians, come to enforce in Ireland the revolutionary new English Commonwealth regime. For Catholics and Royalists at Drogheda, resistance to Cromwell was a desperate last stand. The Parliamentarians, in their view, wished to uproot the monarchy, the social order and all established religion, in favour of a kind of spiritual anarchy where all Protestant sects would have liberty of conscience. Catholics faced outright suppression of practice of their faith. The Parliamentarians were committed also to the thorough destruction of the old Irish Catholic landed class and to retribution for the massacres of Protestants in 1641. From a military point of view,Drogheda also represented a kind of last ditch stand for the Royalist coalition. Ormonde’s Royalist army had been routed at Rathmines when it had tried to take Dublin, just prior to Cromwell’s landing. A successful defence of Drogheda was needed to galvanise Royalist resistance and to hold their shaky coalition together. It is in this sense that we must understand Aston’s refusal to surrender Drogheda, knowing that the consequences could be grave, in September 1649. Looked at from the other side, from the point of view of Cromwell and his commanders and soldiers in the New Model Army, what was at stake at Drogheda looked equally apocalyptic. The New Model Army was the cutting edge of a revolution in England. It had been formed from a purge of moderates and office-holders in Parliament’s armies in 1644 in favour of those whose military competence and commitment to victory had made them stand out – Oliver Cromwell among them. Cromwell famously said, ‘I would rather have a plain russet-coated captain who knows what he fights for and loves what he knows than that which you call a gentleman and who is nothing else’. The New Model were fighting, as they saw it, rights of Parliament against the King but above all for liberty of religion. Each man should have the right to find his own path to salvation. In this sense, the Parliamentarian soldiers believed they were doing God’s work – a conviction that was hardened with each battlefield victory they achieved. And in a rigidly hierarchical society, the idea that everyone was equal before God had explosive implications in the sphere of politics too. At the Putney debates, near London in 1647, the Army proposed an ‘Agreement of the People’, where power would rest with a parliament elected by universal male suffrage. One Colonel Rainsborough declared, ‘really I think that the poorest he that is in England hath a life to live, as the greatest he; and therefore … every man that is to live under a government ought first by his own consent to put himself under that government; and I do think that the poorest man in England is not bound in a strict sense to that government that he hath not had a voice to put himself under’. While Cromwell, as commander of the Army, put down these most radical elements, many of them were in the ranks of the Army at Drogheda. In short this was an ideological army, fired by the belief they were fighting both for God and universal justice. Before them they saw a combination of their worst enemies. First there were the Irish Catholics, responsible for the massacres of Protestants in 1641. Many English Protestants believed that Catholics were literally agents of the devil. ‘You are part of the Anti-Christ’, Cromwell wrote to the Irish Catholic Bishops in January 1650. And just as loathsome to the Parliamentarians were the English Royalists, who made up half of the garrison at Drogheda. Some of them, including their commander, Arthur Aston, were also Catholics. But all of them were denying the will of God, so clearly demonstrated in the Parliament’s victory in the Civil War by continuing to support ‘Charles Stuart, that man of Blood’ – who wanted to return England to tyranny and the Protestant sects to persecution. And there were also practical military realities at work. The New Model Army had landed in Ireland late in the year. Winter was coming and control of Ireland’s eastern port towns was vital if the army was to be supplied from the sea and not to perish from hunger and disease over the winter. Cromwell needed a quick victory at Drogheda. All of these factors help explain why, once the walls of Drogheda were scaled the fate of the garrison was to be so appalling. A depiction of the Parliamentarian assault on the breaches at Drogheda. Cromwell’s siege guns had knocked two breaches in the southern walls of Drogheda and at 5 pm he ordered the simultaneous assault of the breaches. This, it was understood, would be an ordeal for the attackers. They would have to climb up a steep ramp of collapsed masonry that the artillery had knocked from the walls and into a breach where they would be met by concentrated gunfire and hand to hand fighting. Royalist resistance was at first tenacious. Two attacks by the red coated New Model soldiers at the Duleek gate were driven off, leaving ‘heaps of dead’ (about 150 soldiers) at the breach. It took the death, in close quarter fighting at one of the breaches, of a Royalist colonel, Wall, for the Royalists to draw back and allow the Parliamentarians into the town. Once they did however, the battle became a rout and then a massacre. The New Model soldiers gave the Royalists no time to recover from their repulse at the walls – pursuing so closely through the streets that the defenders were unable to draw up the bridge over the river Boyne in the centre of town and organise a new point of resistance. The New Model soldiers pursued the defenders both through the streets and into private properties, sacking churches and defensible positions as they progressed. Cromwell, riding into town after his troops, was enraged by the sight of the Parliamentarian dead at the breaches and recorded, “In the heat of the action, I forbade them [his soldiers] to spare any that were in arms in the town…and, that night they put to the sword about two thousand men”. The Royalist commander, Aston, and his men surrendered on promise of their lives, but were disarmed and killed. Arthur Aston the Royalist commander and 200 of his soldiers fled from the sack of Drogheda into Millmount fort, a citadel that overlooked the town. They surrendered to a Parliamentary Colonel named Axtell on promise of their lives but were disarmed and then killed. 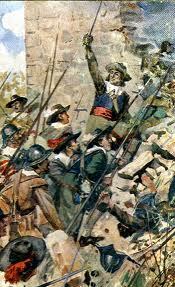 Cromwell wrote to Parliament that his men, “were ordered by me to put them all to the sword”. Another 80 Royalist soldiers who were holding out in St Peter’s Church were burned to death when the Parliamentarians set fire to the Church. The final major concentration of Royalist soldiers was 200 men, stationed in two towers at the walls. They stayed in the towers during the sack of the town but surrendered the following day, September 12. All of the officers and one in every ten ordinary soldiers were killed by being clubbed to death The rest were deported to Barbados. How many civilians died in the sack of Drogheda has never been determined. It seems clear that they were not the primary targets of the massacre, which was Royalist soldiers, but it also seems clear that a substantial number were killed by the marauding soldiers during the chaotic sack of the town. Cromwell spoke of a total of 3,500 dead at Drogheda of whom 2,800 were soldiers – indicating that about 7-800 of the dead were civilians. One Protestant congregation in the town were huddled in the house of their Cleric when New Model soldiers burst in, firing their muskets and killing one of their number. Drogheda was a predominantly ‘Old English’ town – that is Irish Catholics of English origin. In 1641, the town had held off a siege by the Gaelic Irish Catholic rebels under Phelim O’Neill, but some townsmen had helped the rebels – opening a gate for one of their assaults. The fate of a houseful of Catholics during the sack of Drogheda was probably at the least, terrifying and in some cases lethal. I am persuaded that this is a righteous judgement of God on these barbarous wretches, who have imbrued their hands with so much innocent blood; and that it will tend to prevent the effusion of blood for the future, which are satisfactory grounds for such actions which cannot otherwise but work remorse and regret. Historians argue over who the ‘barbarous wretches’ he was referring to were. They could just as easily have English Royalists as Irish Catholics, or perhaps both. In any case, there was also a steely pragmatism about his actions. As another officer wrote, such, ‘extraordinary severity was designed to discourage others from making opposition’. Indeed the neighbouring garrisons of Trim and Dundalk surrendered or fled when they heard the news of the slaughter at Drogheda. Cromwell repeated his massacre at Droghedaa month later at Wexford, where another 2,000 soldiers and civilians were killed after the fall of the town. The massacre at Drogheda became the emblem for the cruelty of the Cromwellian war in Ireland. The ferocity of the New Model Army’s actions at Drogheda and Wexford may or may not have succeeded in shortening the Cromwellian war in Ireland but they certainly shocked both Royalist and Irish Catholic opinion. A fortified place taken by storm expected harsh treatment but not wholesale slaughter and certainly not the killing of those who had surrendered in good faith. A Royalist newspaper in England the following week wrote that 2,000 of the 3,000 dead were civilians—a theme that was taken up both in English Royalist and in Irish Catholic accounts. Irish clerical sources in the 1660s claimed that 4,000 civilians had died at Drogheda, denouncing the sack as ‘unparalleled savagery and treachery beyond any slaughterhouse’. The Irish language poet Daibhi Cundun, wrote, ‘It was then that Cromwell went his deadly way, to let loose the power of the English rabble, spreading havoc and slaughter throughout the land and in Drogheda released his bloody army to strike the women, the children, the men and the troops’. The Parliamentarian campaign in Ireland was not wrapped up until 1653, when the last guerrilla Catholic bands surrendered. It had been enormously costly in human lives – perhaps as many as 15-20% of the Irish population had been carried off by war, famine and plague and in its final years had been less and less connected to the Royalist/Parliament war in England and more and more an ethnic war between English Protestant colonists and Irish Catholics. It ended with the mass confiscation of Catholic owned land by the Cromwellian regime. The massacre at Drogheda is only one part of this story. In many ways this one event, easily deployed as an example of anti-Catholic and anti-Irish cruelty came to represent the trauma of an immensely painful but also difficult to understand period in Irish history. Nevertheless, what happened at Drogheda was, by any standards, including those of the time, a bleak and shocking episode and worthy of remembrance on its own terms. For the details of the massacre see John Morril, The Drogheda Massacre in Cromwellian Context, in Edwards, Lenihan, eds, The Age of Atrocity, Violence and Political Conflict in Early Modern Ireland (2007), 242 -246 and O Siochru, Micheal, God’s Executioner, Oliver Cromwell and the Conquest of Ireland, Faber & Faber 2008, p 77-93. Written by: John_Dorney on 11 September, 2011.on 12 September, 2018. 6 Responses to "Today in Irish History, Cromwell Storms Drogheda, 11 September 1649"